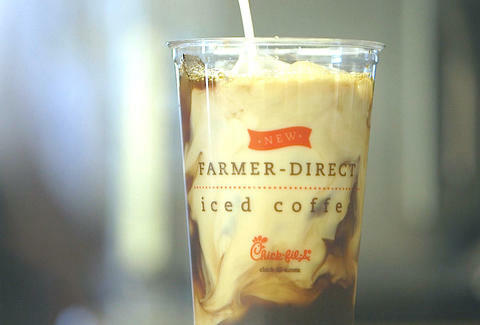 Forget your favorite coffee shop -- Chick-fil-A may be the new go-to destination for America's coffee snobs. That's because the chain just introduced a new specialty-grade blend made specifically for them that also supports family farmers in Central America. In case your coffee knowledge is limited to K-cups, that specialty-grade designation isn't just a fancy name. It means the beans have met the standards of the Specialty Coffee Association of America, making it a very fine blend indeed. The move marks a profound step-up for the Chick-fil-A breakfast menu, which previously featured a sorta universally-hated cup of Joe. And if that wasn't enough good news, there's also a philanthropic angle. THRIVE, the group from whom Chick-fil-A is sourcing its beans, actually shares revenue with the farmers, so buying their coffee gets more money directly to those guys. One cup of the Chick-fil-A stuff starts at $1.59, but you can also go iced for $2.29. Hopefully, it'll make your bleary-eyed morning encounters with the cow mascot less terrifying. Kristin Hunt is a food/drink staff writer for Thrillist, and thinks this is going to spur even more people to desperately bang on Chick-fil-A's doors Sunday morning. Follow her at @kristin_hunt.